The marriage of J Molony and Miss Kenny took place on 30th January when the lonely surroundings of Coolmeen were enlivened by a gay wedding party. The ceremony was performed by Rev D Courtney, PP and Mr Martin Moloney cousin of the bridegroom was best man. The bride, youngest daughter of the late Daniel Kenny Coolmeen, was given away by her brother and looked charming in a biscuit coloured dress trimmed with chiffon and roses. Miss Roche, Ennis, and Miss Mary Reidy, Boloughera were bridesmaids and were tastefully dressed in fawn colour cloth with hats to match. The wedding party were met at Kildysart by a number of young men bearing torch lights who headed the procession through the village. The guests were entertained at the home of Mr Moloney (Martin). Unusual wording for this day and age? The above report appeared in the Clare Journal on Monday 12th February 1900. The wedding took place one hundred and fourteen (114) years ago today. Coolmeen is a townland in County Clare, Ireland. 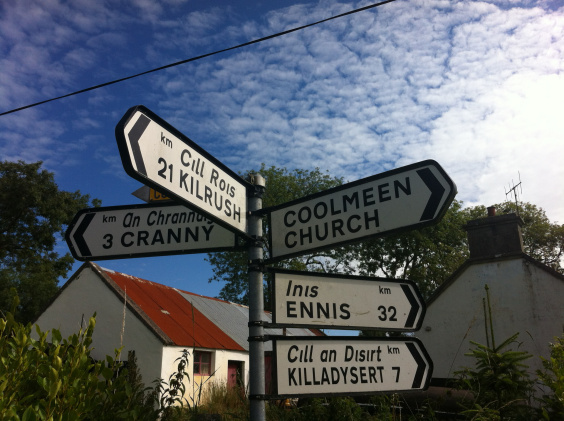 It is located on the north bank of the Shannon Estuary 7 kms (3.5 Irish miles) to the south west of Kildysart. 1. Mr John Molony and his bride with no first name were my paternal grandparents! * She did actually have a first name: Margaret. She was the daughter of Daniel Kenny and Bridget Kelly. The Kenny’s were part of the reason for my auburn hair! 2. The different spellings of the name Molony/Moloney. They were correct. John Molony & Martin Moloney were in fact double cousins, each related through both of their parents. 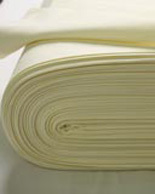 ** Years later my father served his time as a draper’s assistant to Martin Moloney & Sons, Textile Specialists. 3. The description of the outfits worn by the bride and bridesmaids. 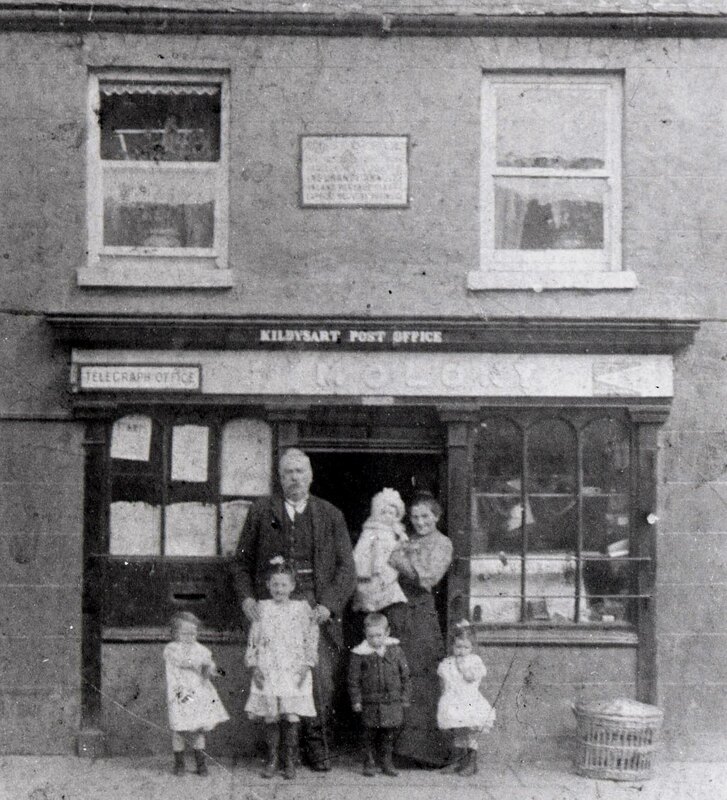 It was in March 1878 that John was appointed Postmaster of Kildysart. The Inspector of Gunpowder and Gun Licenses. He opened a grocery/bar, so stamps and postal orders were sold at one counter and groceries & liquor at the one opposite. My grandfather was the man who anyone wishing to emigrate to America or England, went to for his or her Identification Papers. Mind you, “The Licensing Act of 1872 forbade anyone to be drunk while in charge of a cow or steam engine on a public highway”. I wonder how that effected business on a Fair Day? John later extended his portfolio, as we say today, by buying a small farm – he had a large family to feed and rear, and the boys took their turn at bringing home the cows for milking and taking them back to the fields before and after school each day. My grandmother worked in the shop as well as keeping hens, geese & a goat. I think a couple of pigs were under her charge too! In the early 1900s there were many businesses and trades in Kildysart: saddlers, shoemakers, nailmakers, dressmakers, milliners, blacksmiths, tailors and millers. Alas, most of these no longer exist. Moving forward to 1942/3 the following description of the Kildysert area is interesting. Considered a quiet village in today’s world, Kildysart has minimarkets, hardware shops, a bank, pharmacist, clinic, veterinary clinic, credit union, garage, RC church, Community Centre, Quay Marina and seven pubs. Alas no mention of the Post Office. *Not alone were they my grandparents, but there were many similarities unknowingly repeated in my life. **This double spelling surfaced again in the next generation. My father, Dan Molony married my mother – Eileen Moloney, although she was born in Dublin, her paternal Moloney ancestors came from Murroe in County Limerick, across the mouth of the River Shannon from Kildysart County Clare. The double cousins have come into play for some of my nieces and nephews, since two of my brothers married two sisters. This entry was posted in Family, memories, stories and tagged Family, Family history, Kildysart, Moloney, Molony, Murroe on January 30, 2014 by Grannymar. So very interesting-I loved seeing the photos. Thank you for sharing. I love these old photos, they hold family, social and fashion history. I have a photo of my husband’s grandparents with their children in Co Durham, taken in 1910. Twin brothers about the age of the little boy at the front above, have suits exactly the same. Had the gay wedding taken place today, then the J marrying ‘Miss Kenny’ would have been Jane (hence the dress!). I have just hooked up to a tree on Geni and have suddenly discovered an astonishing number of cousins! Before we had the webbiestuff, my oldest brother did major foot slogging on family research. He then shared all his finds with me. I now have a family tree that covers eight generations going back to 1753 on one side of the family and 1763 on the other. Now there are two generations below me! It is wonderful to have such a spread of roots and branches! Yeah! Plenty of people to blame for my bad bits!! And to take credit for the fruitful ones! Absolutely love stories such as this. Thanks for sharing it with us. Many of the younger generations do not know the family history, so I am recording it for them. Interesting. I suspected that was an old announcement from way before the word “gay” was appropriated to mean something entirely different. So far as double cousins, my siblings are all my fifth cousins (and I’m my own fifth cousin), descendents of Moses and Mary Shinn who married in the 1800s in an isolated mountain community in western Virginia (now West Virginia). They were first cousins. Mike, back in the day, things went on that certainly would not be allowed today! Like Mike, I was bemused at the use of the word gay as in our time, leave alone earlier times, it was a perfectly acceptable term and I was for instance called a gay bachelor for the then very obvious reason that unlike married men, I was gay, ie happy. Apart from that little aside, I found the story fascinating and salute you for the considerable research that you have undertaken to put this down in the post. Lovely post GM, fascinating pictures too, a long history of your family indeed. Lovely that the post office is still standing. My paternal side of the family’s homestead goes back several hundred years. 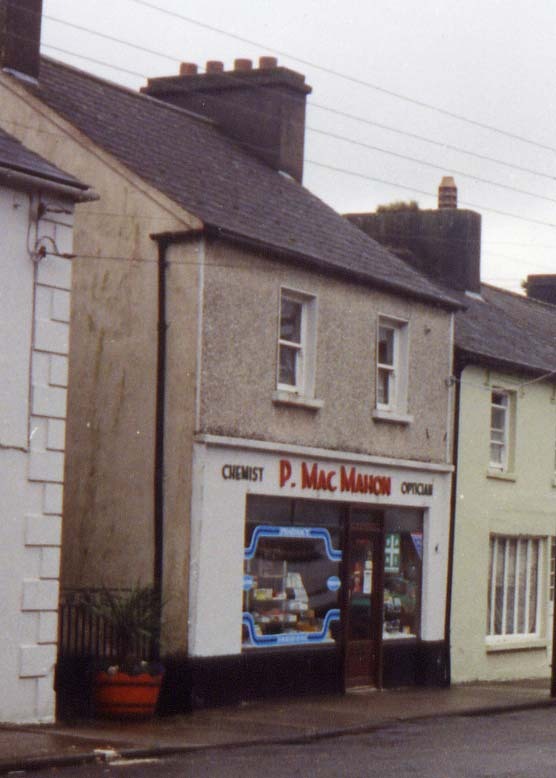 WWW, in mammy’s paternal line the old homestead goes back to 1763, It was a soup kitchen in famine times and is still in the hands of one branch of the family! Dianne, I love the stories from the past, looking at old photos and seeing the younger generation in them. This was wonderful, GM…Excellent writing and interesting subjects. I loved the Peter Dawson song. Best of all, it ended up on my Facebook page and because of that, many of my friends will see it and they will also enjoy your trip down Memory Lane. Nancy L, Glad you enjoyed my trip down memory lane. I remember one of my late uncles singing that song. Thanks for sharing on Facebook. Great post, GM. Family tree with branches that spread over eight generations. Wow! Love the photos. Maxi, Families are now smaller, so I am not so sure how long the name will live on. I was distracted by the “gay” in the wedding announcement. See what word definition changes over the years do to us??? I was amused that it could be an announcement written today. That was good enough, but I went on to read about your grandparents. Surprise. I love that the little boy dressed as a girl went to the U.S. Old stories are fun. Old stories need to be retold before those who know the details are dead and gone! I loved your post and the pictures. Thank you for sharing them. I came across it while researching my husband’s grandfather, Martin J Molony – founder of Martin Molony & Sons. I believe he was born in 1881 in Kilrush. He married Anne Kennedy. Although they met and married in London, Anne was born in 1889 in Kilydsart. The firm had offices in both London and Dublin. Strangely enough, while researching their time in England I found a census for a John Molony who was working as a drapers assistant. I thought there had to be a connection but couldn’t find it. I wonder if the best man Martin Moloney is in fact our Martin Molony. Any further information you might have would be appreciated. Maureen, welcome to my blog. You are on the right track. I have your email address so I will write to you during the week.